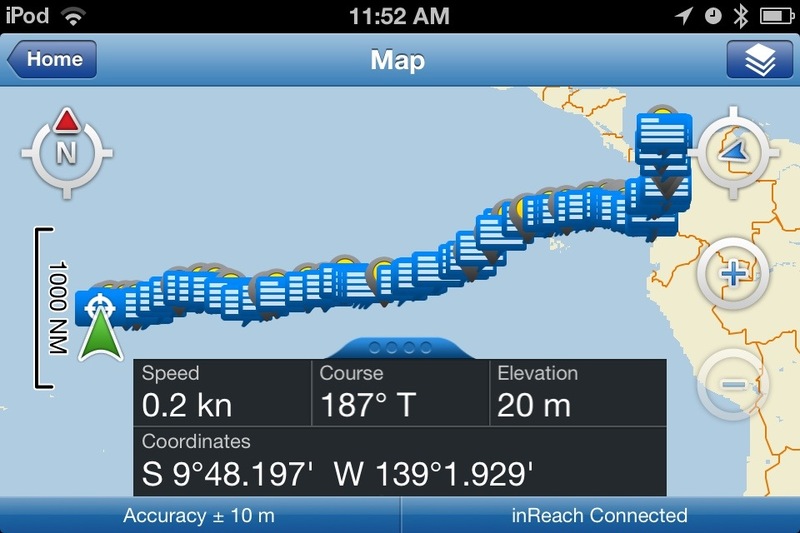 So Wednesday, May 15th we raised the anchor from our spot by Isla Pericos on the Amador(causeway) and were off. made one last stop at the marina off Isla Flamenco (last island on causeway) to fill up water tanks about 1500L in both the central and bow tanks. There was a storm coming in but we were so ready to get out of Panama City. We’d had enough hustle and bustle of the big city, rowing/paddling back and forth in the gunky water to the falling apart dock with all our provisions. 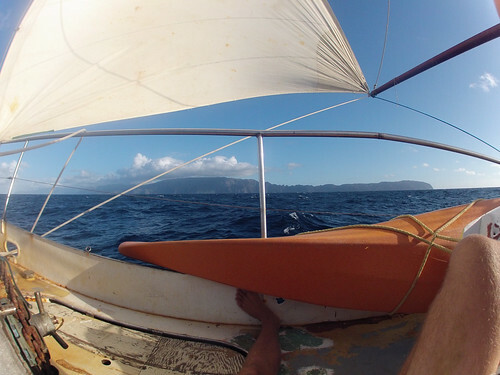 So we finally left for good and it was a nice overnight sail. We anchored between Mogo Mogo and Chapera Islands just south of the major developed island of Contadora. 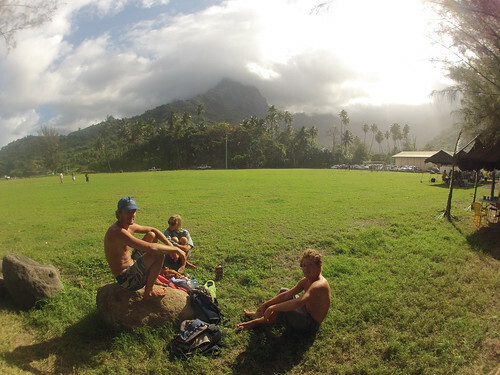 This was a nice sheltered spot to wait out the storm through the next few days. We had some really heavy rains and the temperature dropped. A few of us got colds including myself and it was miserable. Lots of our veggies were starting to go off and it was wet and raining. We had so much fresh food and some of it was starting to go bad really fast. We had bought such a huge bag of green peppers for so cheap but they were the ones going off first. For the most part, we just stayed in and slept for a few days then moved closer to Isla Contadora in the Las Perlas and we go a great Wifi signal from the boat. 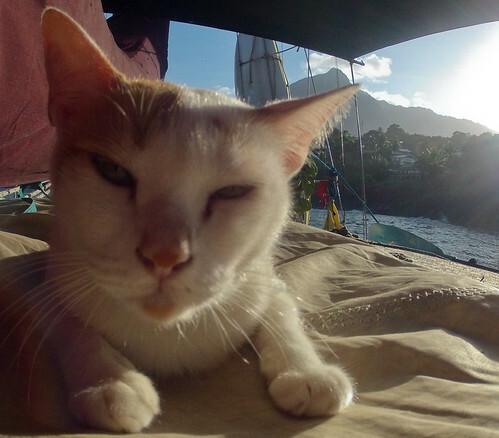 The weather got nicer and we did a lot of interneting, final haul scrapping and relaxing before parting off. Our friend Peter came out with his boat and 4 Swedish crew. We hung out a bit one night and then went exploring the island. Steve, Elena and I took kayaks to one of the outer islands with a nice white sand beach and did some snorkeling and relaxing on land. There was a strange lounge-type establishment built on the islet apparently for the television film crew of “Survivor Turkey”. 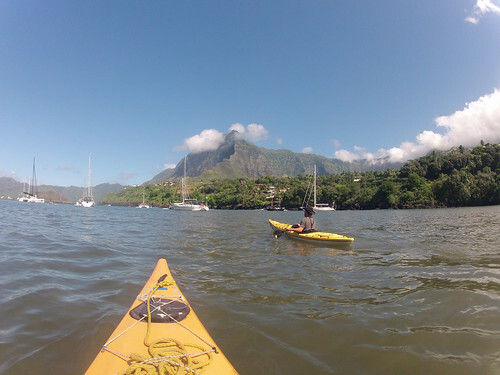 We then paddled over to the main island of Contadora. This heavily developed island had lots of golf-cart type vehicles on skinny well-paved roads that weaved through the small hills to the fancy private homes and resorts, which dotted pretty much the entire coast. There was an airstrip and a small bar/restaurant on the north side of the island where the ferry from Panama City came in. We met up with Peter and one of his Swedish crew, the others had just left on the ferry. We enjoyed some ice-cream and pizza. They’re appeared to be a few other restaurant type establishments but were all closed up. In the main port there were several motor yachts and we found 4-5 perfectly good grapefruits they must have thrown overboard that we enjoyed. Meanwhile, Tom got in contact with another sailboat coming from Panama who had his boat mechanics manual he had lent to a friend previously so we waited another day to rendezvous so this important book could be on board with us for the crossing. The very next morning, Monday, May 20th we lifted the anchor and were finally off. The first few days were really slow as we expected with the notoriously awful calm/squally conditions in the Gulf of Panama. We knew it was going to be slow with lots of thunderstorms and light inconsistent winds. We wanted to head southwest 230-250 degrees towards the coast of Ecuador to be sure we didn’t get caught in calms or a counter current. Years ago before Tom had Karaka he was crewing on another boat with a captain who was not so knowledgeable and experienced. Their plan was to make passage from Panama to the Marquesas in French Polynesia but they got stuck in calms/counter-current northeast of the Galapagos Islands. 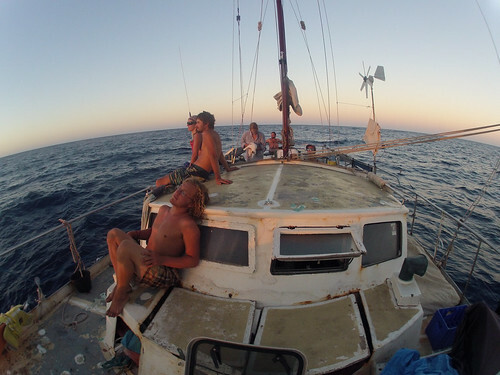 They spent I don’t know how many days/weeks in calms and counter-current that was pushing them so far astray from their destination that a decision was eventually made to make the nearest possible landfall in Acapulco, Mexico after 51 days at sea. Anyway this was not going to happen to us! So we wanted to head southwest but the problem was that this was the exact direction of the prevailing winds so we had to do wide tacks back and forth very slowly making forward progression. I was also having trouble with the InReach connection until I figured out that I needed to shut down all other programs on my Ipod touch so it would connect through bluetooth and get an accurate GPS signal. 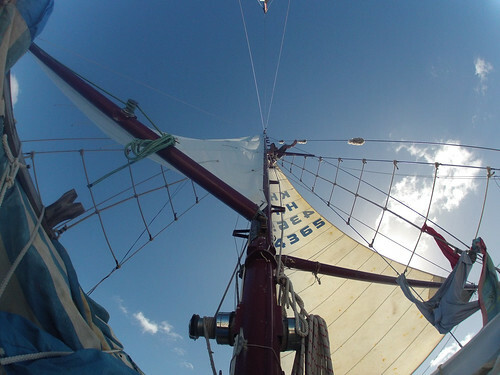 So we were tacking back and forth from 300 to 160 with conditions changing quite often from calm to high winds causing us to make lots of sail changes. We started catching some nice tuna and dorado whenever we were going fast enough (usually 4+kts). As we approached the Colombian/Ecuadorian coast we continuously were getting caught in the fishing lines of long-liners around 100nm offshore. We were even approached by 4-5 men in a small panga some 80-100nm offshore at first light who approached us really close and kept asking for water. The scary thing is you never know in a situation like this if the fisherman really just want some more water or if they are just trying to get in closer, even onto our boat, hold us up and rob us. 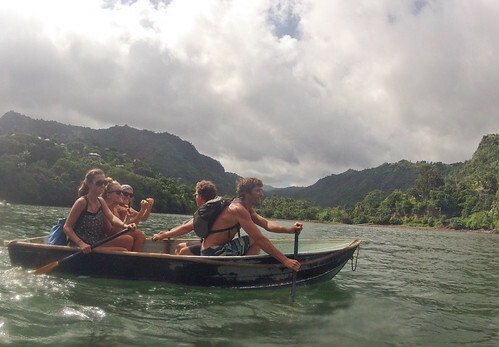 With Tom’s experience in Cartegena, Colombia a few years previous when Karaka was approached upon arrival involving four strange men in a panga who held him and the crew up at gun/knife point, its no wonder he is on edge when strangers approach in a small boat especially out in the middle of the ocean. I don’t blame him at all for flashing his black BB pistol at the men in the panga. It looks exactly like a handgun from a distance so just the sight of it could act as a real deterrent to any potential piracy. 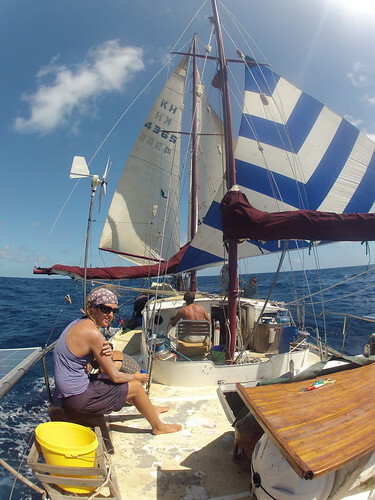 We all came on deck and threw them a 1L plastic bottle of water and expressed that this was all we can give them because we needed our water for our long passage to French Polynesia and that was that. We came within only a few miles of the small town of Canoa just north of the entrance to Bahia Caracas in Ecuador. It would have been so great to stop to spend some time here in Ecuador, but we had been delayed already so much and it was early June, we needed to get to Polynesia to maximize our time there. So we had a brief glimpse of land and were off again tacking back and forth to get out towards the Galapagos still had a ways to go. 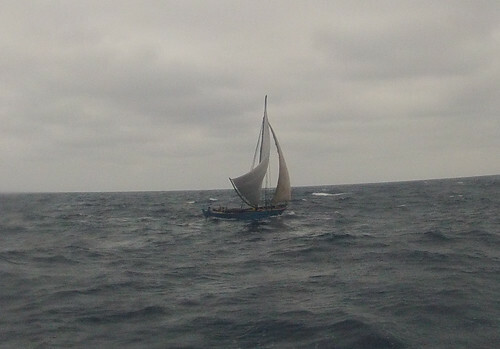 We saw this strange wooden open sail boat some 300nm offshore. It had it’s sailed set up to just ride the wind and waves out. The men on board were all bundled up and looked happy. 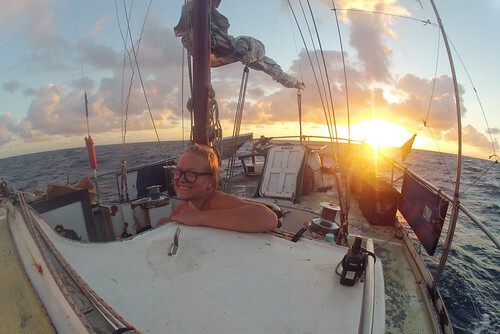 The temperature really dropped out here we still had some messy conditions with heavy rains and unfavorable winds but within 200nm of the Galapagos we started getting some more consistent smoother sailing conditions that were helping us move at a nice 4-5kts. 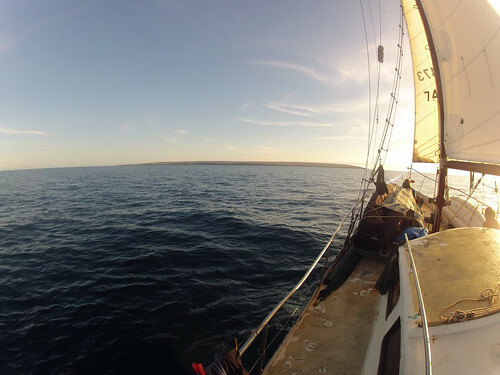 After 3 weeks of sailing we were finally within sight of the Galapagos and had a beautiful calm evening in the lee of Isla Genovesa. It was quite painful not to stop at these gorgeous volcanic islands. We spent a few days sailing fairly close to a few of the islands and were then offshore again cruising along nicely 5-6kts. The first week after the Galapagos we caught so many tuna and dorados. We had fairly consistent conditions but then we got this awful cross swell, which didn’t really leave us. We did lots of sail adjustments to find the smoothest and most efficient course but the constant rolling and bobbing side to side really impacted the group moral. The days just drifted by and though the group moral was low because of how long it took we held it together pretty good. There were lots of periods of squally weather we went in and out of, the wind picked up and died but remained pretty constant. The downwind sailing was hard steering and with the side swell it was hard to maintain a good speed. The days just blended into each other, struggling to cook meals for each other, just passing the time between watches, eating, sleeping, reading, watching movies etc. So much introspective time. 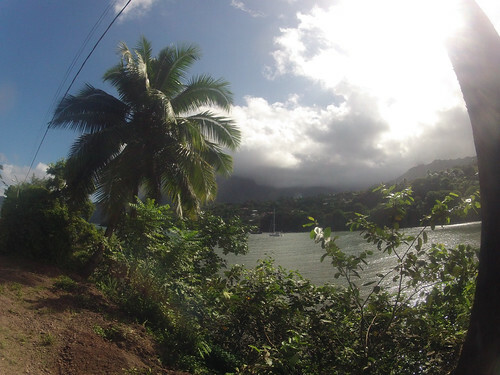 It was a long tough crossing but we dropped bow and stern anchors in the tight little bay next it to the village of Atuona, Hiva Oa in the Marquesas Islands, French Polynesia around 12pm on July 13th, 2013 after 54 days and 4798nm. 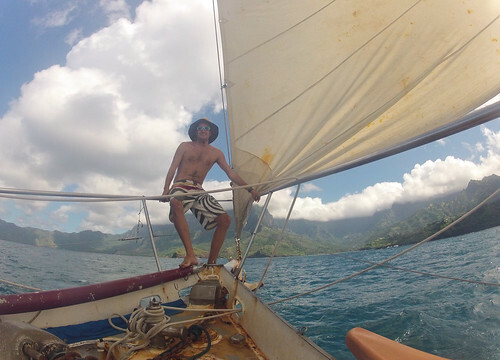 This entry was posted in Sailing and tagged karaka, offshore, Sailing by zkruz. Bookmark the permalink. Wow, thanks for the update! This is awesome,it sounds so crazy and amazing. And you are getting closer to Australia! Amazing. Sven will be back there in a month, but I wont be back for another year. Take care, hope you’re having a great time. I can’t really imagine that many days at sea, but its wicked. How much $ did it cost to go through the Panama Canal?